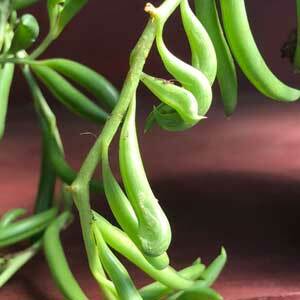 A succulent plant with a trailing habit, The String of Beans plant is Senecio radicans. Very unusual green ‘bean shaped’ leaves are the feature and it is great indoors plant. This is another plant that is said to have air purification properties. Also known as the Fishhooks Senecio this is a plant grown for the foliage rather that the flowers. It will flower in late winter to spring with small creamy white flowers with a slight fragrance. All parts of the pant are poisonous including to both cats and dogs. Naturally preferring filtered light rather than sun, the String of Beans plant is easy care and low maintenance. It grows well in a container or in a hanging basket where the trailing nature of the foliage can be best appreciated. Being a low water requirement plant is a strong feature. In fact during winter months the soil can be allowed to dry almost fully between waterings. From spring through summer regular watering will aid with appearance. In winter – Water only when the soil has dried out almost completely. In summer – Water only when the the top of the soil is dry – usually no more than once a week, or once every 2 weeks. Try to water the growing medium rater than the foliage itself. Prune after flowering to maintain a more compact growth habit. Common problems can be caused by the following factors. Soil or Potting Mix is to heavy and not draining – This causes rotting and fungal problems. Overfertilisation – This causes stretching and strange growth. Atmosphere is to humid. – Many gardeners do like topmost spray, and this raises humidity, great for some plants however it can cause fungal and rotting problems with Senecio radicals. To much direct sun – This causes leaf burn, even through windows. Continual bright light – All plants like a rest, during winter, give the plant a little rest in a slightly darker position. Over potting – Pots that are to large can contain to much moisture for the root system to handle. Lack of light – Good strong filtered light is needed. Mulch – Using mulch on the surface of the soil can also retain moisture and cause rotting. Common Name – String of Beans Plant, String of Fishhooks. Flowers – Small white flowers in late winter to spring. Foliage – Mid green and Bean Shaped. All parts of the pant are poisonous. Senecio jacobsenii – The Trailing Jade Plant.